Blogging and social media are a big part of today’s new marketing world. That’s why more companies are adding the microblogging site Twitter to their marketing strategies. Whether you’re looking to generate new sales leads or get more business from your current customers, a Twitter profile can help you reach your marketing goals and objectives. According to a 2010 study by Edison Research, more than half of active Twitter users follow companies, brands or products on social networks, 79% of US Twitter users are more likely to recommend brands they follow and 67% of US Twitter users are more likely to buy from brands they follow. With stats like these, it’s easy to see why so many companies are flocking to Twitter. It’s also why we’ve created a four-part blog series to help you build an effective Twitter presence for your company. You can read the rest of the series here during the next three weeks – or subscribe to our blog to get the rest of the series delivered straight to your inbox. 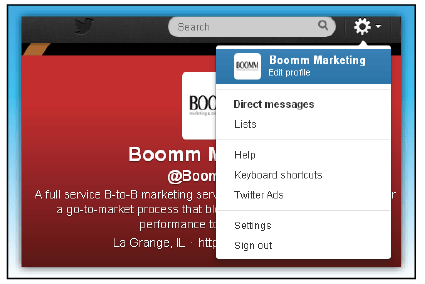 If you are new to Twitter, you’ll need to begin by creating a company profile. To do this, complete the Full name, Email and Password fields on the home page and click Sign up for Twitter. When Twitter prompts you to Choose Your Username, be sure to use one that matches your company’s other social networks. Upload your company’s logo as your Photo. Type your company’s website URL. Type a 140-character Bio about your company. You can also dress up your profile by adding a 520 x 260 pixel Header image that highlights your company – or its locations, products or employees. The final step in creating a Profile is Design. You’ll want to upload a customized Background Image with your company’s branding elements and use colors from your company’s color palette as your Background Color and Link Color. Then just click Save Changes and your profile will be complete. Now that you’ve set up your company’s profile, you’ll need to find people who are interested in the information that your company posts on Twitter. We will talk more about this our next blog post on building an audience. Thanks for the tutorial. I’ve shied away from Twitter so far, and don’t like the Facebook interface, but who knows, maybe that’ll change. Thanks for the comment Mike! Twitter is a great way to connect with new people (and pretty fun too). Thank you, Eileen. Twitter is having a major impact on our world. It is becoming indispensable for business. Your tips are very helpful. All the best! Thanks Ken … really appreciate the kind words! Thank you Maxima … hope this is helpful to you! Thank you for this information! Please answer me about delete Facebook account?